This page authored by Hannah Scherer, Stanford University. In this introductory geology lab, students are introduced to the processes involved in metamorphism through hands-on study of rock samples. They first examine three suites of rocks (regional metamorphism of mudstone, high-P/low-T metamorphism of basalt, and high-P/high-T metamorphism of basalt). Students then describe rocks with different metamorphic textures and other protoliths. They also examine key metamorphic minerals and infer the metamorphic conditions under which they are stable based on their observations of the rocks. Students answer summary questions at the end of the lab. Use what they have learned about igneous and sedimentary rocks in order to make statements about how these rocks change during metamorphism. This activity was designed for use in an activity-based undergraduate introductory geology course at a large research university. The class size can vary, but is usually 40-50 students working in groups of 2-3 people. At least 2 hours are needed for the activity. Including the mineral identification part, it will take about 2.5-3 hours. Each student has a handout and their own hand lens. Dilute HCl is available for them to test for calcite. This activity was designed as the main metamorphic rock lesson. 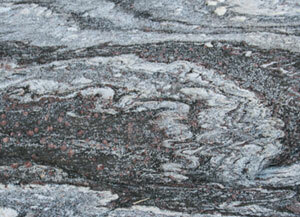 It follows igneous and sedimentary rock classification and identification. In the class preceding this activity, students learn about regional deformation (folds and faults) by looking at geologic maps. Pieces of this activity may be used on their own in a different setting, but access to appropriate rock and mineral samples is essential. Students are assigned a reading on metamorphic rocks to be completed before class. They are given a list of terms to pay attention to while reading. The in-class activity is described for the students in the Student Handout. They are also given a mineral data sheet to record their observations. An example of the "choreography" for a 1 hr and 50 min class is provided with suggestions for background material to cover during the activity. This is not a graded activity; students have access to the answer key once they have completed the lab so they can check their work and ask questions during the next class meeting. Students identify metamorphic rocks and answer questions about them on an exam.